Red Rock Stories conveys spiritual and cultural values of Utah's canyon country through essays and poems of writers whose births span seven decades. First delivered to decision makers in Washington as a limited-edition chapbook, this art-as-advocacy book explores the fierce beauty of and the dangers to ecological and archaeological integrity in this politically embattled corner of wild America. Red Rock Stories features three generations of writers from diverse cultures. Young activists and regional leaders fill the pages with heartfelt testimonies for the red rock wilderness. Notable contributors range from acclaimed writer Terry Tempest Williams and Poet Laureate of the Navajo Nation Luci Tapahonso, to Charles Wilkinson of the University of Colorado Law School and Regina Lopez-Whiteskunk of the Ute Mountain Ute Council. Stephen Trimble, editor of Red Rock Stories, has published more than twenty books. He received the Sierra Club's Ansel Adams Award for photography and conservation and a Wallace Stegner Centennial Fellowship at the University of Utah Tanner Humanities Center. 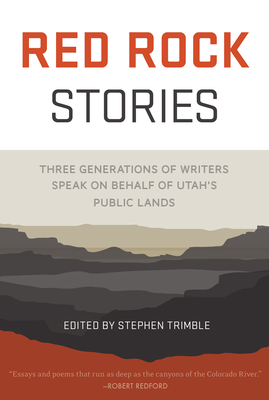 In 1995, Trimble co-compiled with Terry Tempest Williams the landmark book of advocacy, Testimony: Writers of the West Speak on Behalf of Utah Wilderness--the model for Red Rock Testimony. He teaches writing in the University of Utah Honors College and makes his home in Salt Lake City and in Torrey, Utah. Stephen Trimble was a park ranger at Arches and Capitol Reef national parks in his twenties and has since published more than 20 books. He received the Sierra Club's Ansel Adams Award for photography and conservation and a Wallace Stegner Centennial Fellowship at the University of Utah Tanner Humanities Center. In 1995, Trimble co-compiled with Terry Tempest Williams the landmark book of advocacy, Testimony: Writers of the West Speak on Behalf of Utah Wilderness--the model for Red Rock Testimony. He teaches writing in the University of Utah Honors College and makes his home in Salt Lake City and in Torrey, Utah.